Independent methane detections in the Martian atmosphere by the Curiosity rover and Mars Express orbiter add confusion to a convoluted story. Is there methane in the Martian atmosphere? Planetary scientists have been trying to unravel this riddle for almost two decades, but definitive answers have remained elusive. There have been several detections of the molecule by different instruments, such as NASA’s Curiosity rover, the European Space Agency’s (ESA) Mars Expressorbiter, as well as several ground-based telescopes. But the reliability of these detections has been widely debated, and the scientific community is still divided. Now, an international team of researchers using the Planetary Fourier Spectrometer (PFS) onboard Mars Express has announced an independent detection of methane above Gale Crater, Curiosity’s landing site, right after the rover itself measured a methane spike. The PFS instrument saw up to 15.5 parts per billion by volume (ppbv) on June 16, 2013, a day after Curiosity detected up to 5.78 ppbv. The PFS team has also performed atmospheric simulations and geological analysis in order to track the origin of the methane emission. The researchers point to the same potential source as the Curiosity team did back in 2013: a fault area southeast of Gale Crater. They describe their findings in the April 1st Nature Geosciences. Confirming the presence of methane is a big prize for researchers, since this gas could be related either to life or geological activity. On Earth biological sources, including a type of bacteria called methanogens typically found in anaerobic environments such as inundated soils or cows’ guts, produce 95% of the methane in our atmosphere. Geological processes also release methane into Earth’s atmosphere, for instance, certain reactions between minerals such as pyroxene and water. Since the latter ingredients are also present on Mars, Martian methane could originate from similar geochemical reactions. The Martian gas could also been produced eons ago, when liquid water was more readily available, and then trapped underground or bound to buried ice. According to Marco Giuranna (National Institute of Astrophysics, Italy ), the principal investigator of the PFS instrument who led the new study, 15 parts per billion might seems like a small amount, but it’s quite remarkable for Mars. The researchers estimate that the area covered by this study, a total of 49,000 square kilometers, contains between 39 and 54 metric tons of methane. For comparison, Earth’s atmosphere currently has around 1800 ppb (although it had half that before the start of the Industrial Revolution 200 years ago). This coupling of results happened largely by chance. Giuranna decided to monitor the atmosphere above Gale Crater between December 2012 to July 2014, shortly after Curiosity’s landing. This decision gave him a great opportunity to test a previously unexploited observation mode of the PFS, called spot-tracking mode, which points the optical instruments to a surface feature on Mars and tracks it, obtaining several hundred spectra over a period of minutes. “These observations are particularly suitable for methane retrievals,” Giuranna says. Giuranna and colleagues confirmed Curiosity’s methane detection above Gale Crater in December 2013 — you’d think that would be enough to confirm the presence of this gas in the Martian atmosphere. But the methane issue is complex, and there’s some strong evidence pointing in the opposite direction. The new data comes from the ESA’s Exomars Trace Gas Orbiter (TGO), which began scientific observations in April 2018. TGO is equipped with two spectrometers — the NOMAD and the CAS — to measure small amounts of gases in the Martian atmosphere. NOMAD in particular can detect methane concentrations up to 50 parts per trillion, making it 100 times more sensitive than PFS. But so far NOMAD and the other TGO instruments have failed to detect the slightest amount of methane. The team released some preliminary results during last fall’s meeting of the American Geophysical Union, and a paper detailing all of TGO’s findings (or the lack thereof) is expected soon. So, how is it possible that instruments on the ground and in orbit have detected methane, yet the most advanced methane-hunter ever sent to Mars hasn’t seen any? One possible explanation is that methane isn’t a permanent ingredient in the Martian atmosphere. Some researchers think there might be methane reservoirs trapped underground, which can find their way to the surface under certain conditions. For example, permafrost — a frozen layer of soil close to the surface — may prevent methane from escaping. If seismic movements or other events disturb this layer, the imprisoned methane underneath might escape into the atmosphere in short-lived bursts. 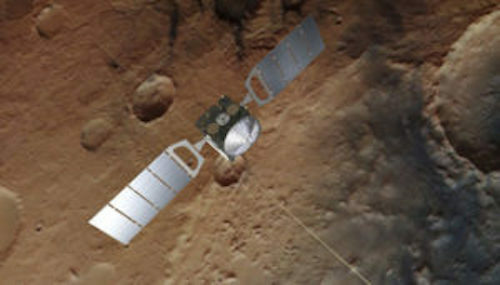 This scenario could be consistent with the recent observations made by Curiosity and PFS, because the instrument onboard Mars Express detected methane in only one of several orbital passages. The orbits when PFS didn’t detect anything coincided with times that Curiosity reported low methane measurements. 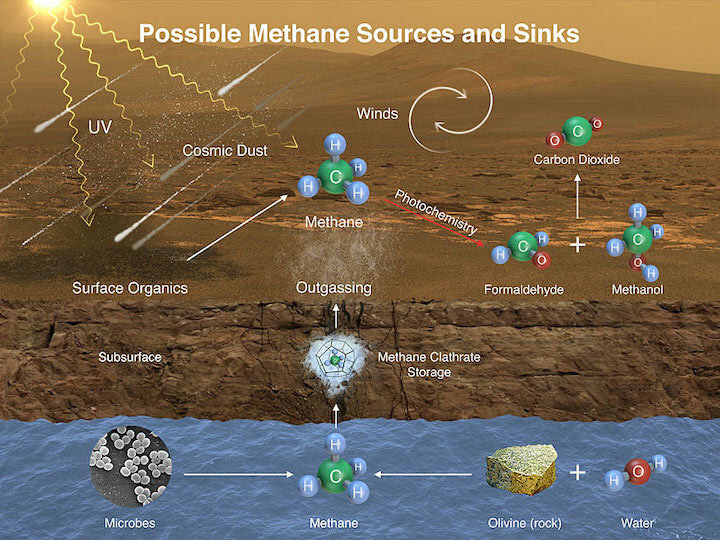 There are several ways to add methane to Mars's atmosphere (and take it away again). Although microbes are the most exciting possibility, other likely sources include reactions between water and the minerals olivine or pyroxene, or solar ultraviolet radiation breaking up meteoritic dust on the planet's surface. But this scenario remains incomplete: even if methane were released in short-lived episodes, current models suggest it should stick around in Mars’s atmosphere for another 300 years or so before breaking down and escaping to space. So TGO should still be able to find the methane. The fact that it doesn’t suggests that scientists will have to figure out another mechanism that could remove the methane from the atmosphere more quickly.